Just enter coupon code 'freegift3' in checkout. Getting into your car late at night? Surprised at your door? Think someones lurking in the shadows? Please stay alert to possible danger, and carry the worlds smallest and most convenient protection device with you at all times. The Terminator Spray Guard helps you defend yourself without a struggle. 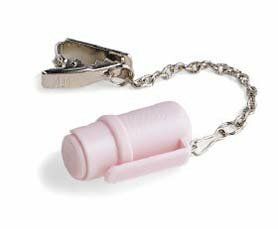 The 2-inch capsule sprayer comes with a chain and jaw-type clasp and a built in clip. It stays within easy reach on your belt, neckline, handbag and even attaches to your watchband! Or you may keep it on your keychain. It holds three bursts of natural pepper spray, a strong irritant that wont do any permanent harm. One spray is usually sufficient. Dont be a victim. Get this device for yourself and everyone you love! Check with your local law enforcement agencies for legality.